View More In Pump & Spray Bottles. Industrial plastic spray bottles for cleaning solutions and chemicals with chemical resistant trigger sprayers nozzles. 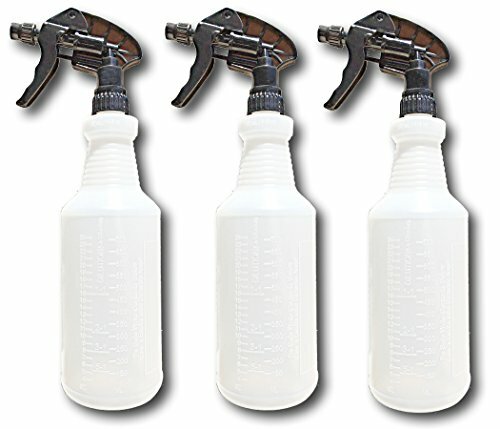 Multi-pack of three (3) 32 ounce empty, clear spray bottles with chemical resistant trigger sprayer nozzles. Gradations on bottles with area to write bottle contents. Perfect for household cleaners, commercial and industrial use, auto detailing, beauty, pets, pest control and gardening. ***Save time and money with this multipack! *** 1) Please always store in an upright position! 2) If using bleach, or other caustic substances, avoid storing solution in bottle. Rinse after each use to prolong trigger life. PERFECT for Industrial Gardening, Commercial Cleaning, Janitorial, Auto Detailing, Household Cleaning, Beauty, Pets and More! PLEASE ALWAYS STORE YOUR BOTTLE IN AN UPRIGHT POSITION!! !